Our highly skilled team hand-make and hand-finish each individual piece of furniture in our West Sussex workshop. A truly bespoke service, we build our kitchens to suit your tastes and needs. By using proven traditional joinery methods and selecting the finest materials we ensure our kitchens are both stunning and unique every time as well as created to last a lifetime. Sleek surfaces and clean lines, our modern kitchen teams traditional construction with stylish mid-century design. Made entirely by our skilled team, the Modern Kitchen features sturdy doors that are perfectly laid onto a solid timber frame. The modern carcass consists of a very durable plywood construction finished with a real wood veneer and solid drawer boxes with a traditional dovetail joint. Our modern kitchen is painted with a high quality spray finish in a colour of your choice for a beautifully clean and linear kitchen. Handmade using traditional joinery techniques and only the finest materials, our Classic Kitchen offers a luxurious take on classic shaker design. Handmade by our skilled crafts-people, the Classic Kitchen features a surrounding frame made from Tulipwood, a sturdy American hardwood that offers a smooth and durable painted finish. Our doors are made from Beech to ensure excellent straightness. Carcasses are made using cross-laminated plywood with a choice of real-wood veneers and solid hardwood dovetailed drawers. 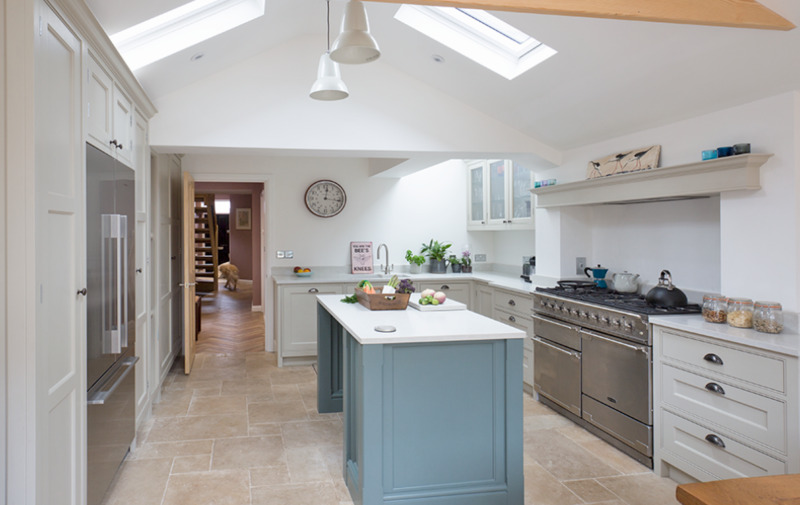 Our Classic kitchen's are finished and painted by hand here in our Sussex Mill. We offer a large range of colours including many neutrals for you to choose from to complete your perfect finish.